Nine former Louisiana-Lafayette players who competed for the Rajin' Cajun' program led by Coach Michael Lotief have retained an attorney to file complaints against the university. Photo by NFCA. Ten months after the firing of former Louisiana-Lafayette Head Softball Coach Mike Lotief last November, nine former players have announced they have hired attorney Allison A. Jones to file complaints with the Office of Civil Rights for Title IX violations and will potentially take legal action if their requests for change aren't met. Jones is also representing four female professors who are “alleging sexual harassment and blatant gender discrimination” against the university. A press conference is being held today in Shreveport at the law office of Downer, Jones, Marino & Wilhite in Shreveport, Louisiana to detail what action the players, professors and law firm will take. We will have more information as the story unfolds… below is the press release in its entirety. During the month of September 2017, Title IX violations were, once again, brought to the attention of the administration of the University of Louisiana Lafayette. Now, those violations are being investigated by the Office of Civil Rights due to efforts by nine former, female softball players to ensure compliance with the law. 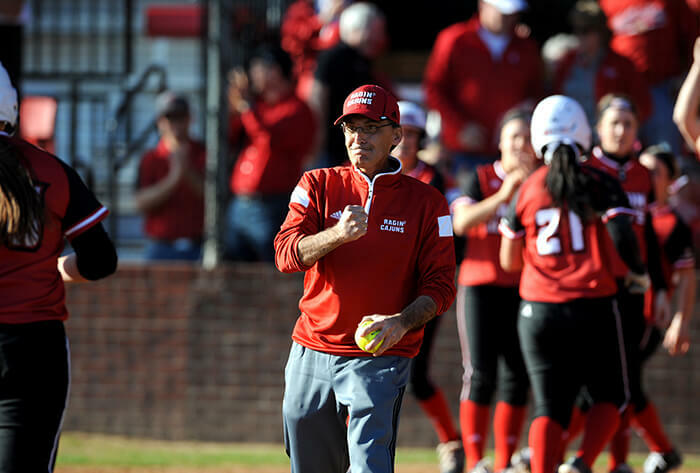 In November 2017, just weeks after Coach Michael Lotief, one the nation’s most successful softball coaches, informed Administrators of the University of Louisiana Lafayette, that ongoing Title IX violations needed to be remedied, Coach Lotief was fired (for reasons which are now being challenged as pretextual for retaliation). Following the firing of their coach, the female softball players of University of Louisiana were locked out of their locker room and left with uncertain futures. They have decided to fight back by filing complaints with the Office of Civil Rights for Title IX violations and by threatening litigation. Nine female, softball players, Aleah Craighton, Alyssa Denham, Chelsea Lotief, Doni Sanders, Miranda Grotenhuis, Sarah Koeppen, Shae Schreckengost, Kimber Cortemelia, and Teryn Haley Pritchett have filed complaints with the Office of Civil Rights alleging that they were deprived of appropriate trainers, comparable playing facilities, equipment and supplies as the same were provided to their similarly situated male athletes. They further allege that their coaches were denied payment, scholarships were not properly honored, and that, despite their complaints regarding Title IX violations, no appropriate remedial action was taken. The players have now retained counsel, Allison A. Jones, of the law firm Downer, Jones, Marino & Wilhite, to pursue their claims. Ms. Jones, a well-known civil rights advocate for women, is also representing four female professors, Lise Anne Slatten, Lucy Henke, Patricia Lanier, and Gwen Fontenot, who have filed claims with the Equal Employment Opportunity Commission alleging sexual harassment and blatant gender discrimination by University of Louisiana – Lafayette. “The University of Louisiana Lafayette has a shameful record of condoning gender discrimination -- for both students and faculty. The University has consistently failed to adopt necessary policies to prevent gender discrimination, has failed to investigate complaints of gender discrimination and, instead, has chosen to engage in a modus operandi of retaliating against any complainant. Coach Lotief’s case is just one example, and the University’s conduct has extended to the female softball players and female professors – all of whom have only asked that policies of the University simply comply with the law. If University students are being asked to become agents of change, then my clients are prepared to lead the charge. Each of my clients is committed to seeing gender equity at University of Louisiana Lafayette become a fact. The University’s Administration should: (i) ask serious questions of its Human Resource department and legal counsel; (ii) find a way to resolve all these conflicts as soon as possible; and (iii) immediately begin to support gender equity in all programs. The students and faculty deserve no less. A press conference has been scheduled regarding these legal claims for September 12, 2018, at 1:00 PM in the offices of Downer, Jones, Marino & Wilhite in Shreveport, Louisiana.